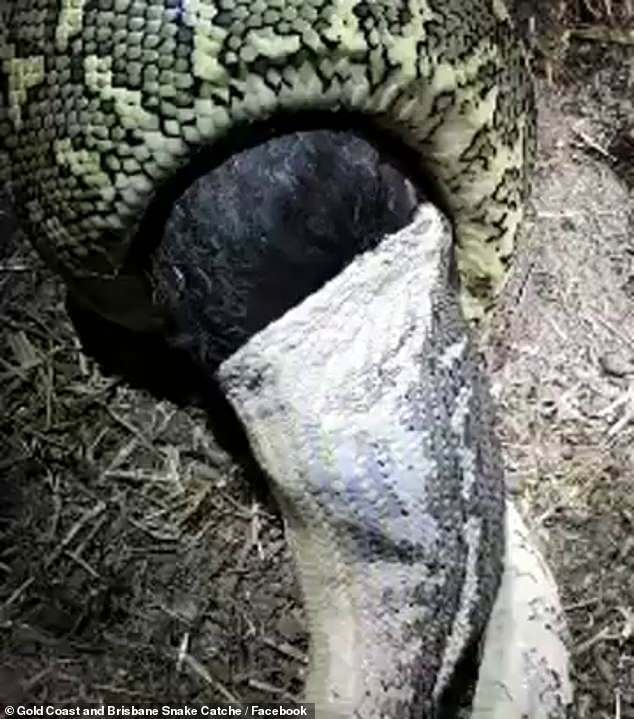 A snake catcher filmed the incredible moment a python devoured a family’s pet chicken inside their shed. Gold Coast and Brisbane Snake Catchers shared the video of the 2.5m python swallowing the bird on its Facebook page on Friday. Snake catcher Tony Harrison told Yahoo7 that the snake was so large it could have been ‘knocking off’ a chicken every week. The family believe the python is responsible for at least one other missing chicken, he said. ‘There was a second one in the barn too but he was mainly eating rats and mice so the homeowner asked that we leave him alone,’ he told the publication. 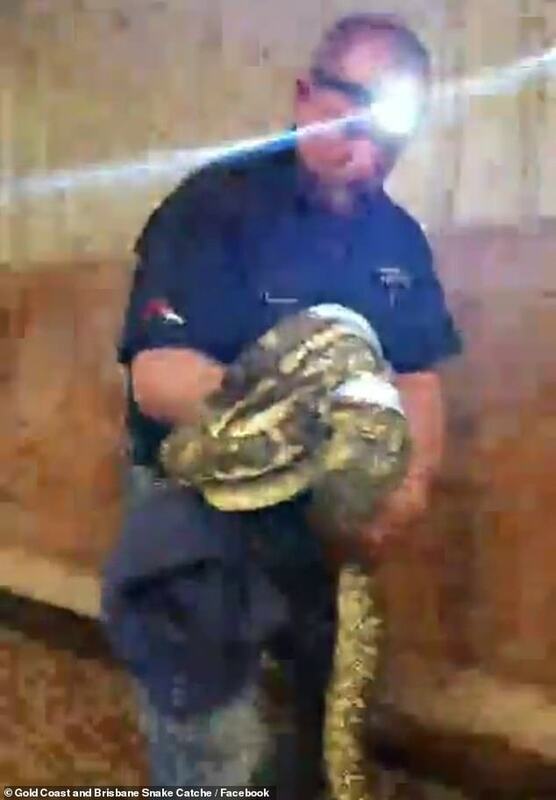 The video shows Mr Harrison enter the family shed in the dead of night to find the two metre python already in the process of eating the whole chicken. He he gets in for a closer look the snake seems to tighten its grip on its dinner. ‘Unfortunately I’ve got two options, to sit here and let him get that down or I touch him and re regurgitates it,’ Mr Harrison said. 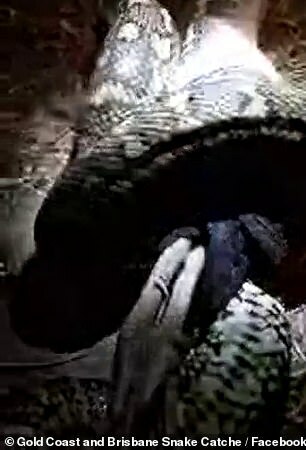 The snake finished consuming the chicken in less than 30 minutes. Mr Harrison took advantage of the fact the snake was lethargic after digesting the chicken before removing it from the shed. Gold Coast and Brisbane snake Catchers told Daily Mail Australia the family was upset because the chicken happened to be a family pet. Meanwhile social media users shared their opinions on the video. ‘I just feed my 3 snakes tonight, they really enjoyed their frozen thawed rats! Now that fella there is really enjoying his meal tonight as well,’ one social media user wrote on the video. ‘I normally eat half a chicken from Charcoal Chickens. This snake is just plain greedy,’ another added jokingly. ‘Always amazes me,’ a third added.